Manchester City's Sergio Aguero has topped the Power Rankings this week. 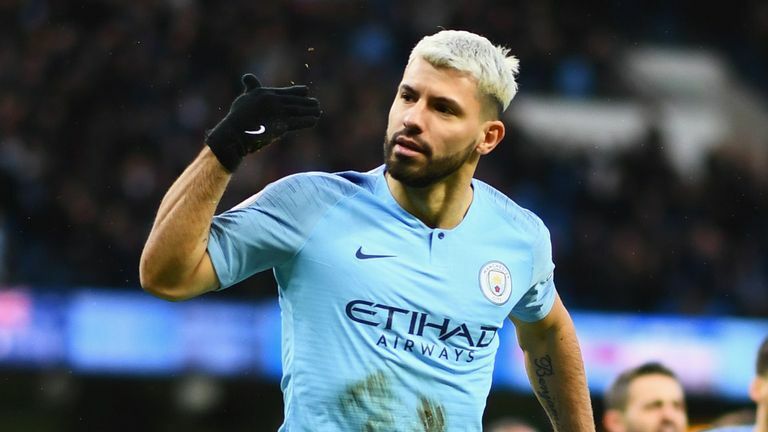 The Argentine smashed a hat-trick past Arsenal in a 3-1 win at the Etihad - extending his league tally to 14 this season. Wolves claimed their third successive win after beating Everton 3-1, with Raul Jimenez (No 2) netting his third goal in two games and team-mate Joao Moutinho (No 6) recording his fifth assist in three games. Bournemouth's Josh King (No 3) slipped down the chart after the Cherries suffered a 2-0 defeat at Cardiff - having beaten Chelsea 4-0 just three days earlier. Liverpool's Sadio Mane broke the deadlock before his side conceded six minutes later in a 1-1 draw at West Ham - a result that opens the door for Manchester City to leapfrog the Reds on Wednesday night. Heung-Min Son maintained his sensational run in form - punctuated with a brief stint on international duty - after netting Spurs' late winner against Newcastle. Southampton duo James Ward-Prowse and Jan Bednarek made the top 10 after a 1-1 draw at Burnley, while Eden Hazard scored twice as Chelsea thrashed Huddersfield 5-0 to reclaim top spot in the season accumulative chart. Below, we present the in-form chart based on performances over the past five Premier League matchdays (with greater weight placed on recent games), your club's top points scorer and the season chart.